This post is a response to the Weekly Writing Challenge, asking for descriptions of a person, place, and thing. Being me, she was the kind of person I would notice, I never did find out her name. I didn’t want to interrupt the girl’s time with her mother, or upset her in any way. At least, I think the woman with her was her mother. They did look a bit alike. The girl herself had a wonderful mega-watt smile; the kind that is instantly contagious. Beautiful girl, sat in an ugly standard-issue wheelchair, of the sort that is seen everywhere: steel frame, red sides, 4 small wheels, so not very easy to push, either. Heavy and burdensome, though covered in stickers to make it look a little more cheerful, and somehow also made it seem more personal. The girl herself was very pretty, brown hair in a pony-tail, brown eyes, neat features, and as I’ve already said, her infectious smile. She wore school uniform, though I do not remember what colour, this being some time ago, and gave no clue as to her age. There seemed to be no personalisation to it as other teenagers might do. It wasn’t until sometime later that I realised this girl had down syndrome. I guess that smile had something to do with it. I do not remember what the girl had to eat or drink, though I remember juice of some kind, perhaps a “fruit shoot” or similar, as I know the cafe sells those. The girl and her companion be they her mother, a carer or guardian, did not stay long. The cafe itself attracts a whole mixture of people, though I have never seen anyone go there who seems particularly well off. I have been there several times, sometimes months apart. To me, the place is either mobbed or empty, there is no happy medium. It is unusal in that it is entirely staffed by volunteers, many of them elderly, or disabled in some way. One might assume this is because it is often elderly or disabled people who have the time to volunteer, or the desire to do so, and therefore make volunteering a priority. There is always a cheerful atmosphere about the place, whether it be busy or quiet, and Christian music playing in the background. I always find there is a peace about the place which is attractive. No one ever seems in a hurry to leave, or in a hurry to make you leave. After costs, any profit is ploughed back into the place, or given to charity. There is a notice on the wall on the left-hand-side which explains this, and lists which charities received donations in which year and how much for. Alongside this there are sometimes framed certificates from the recipient charities thanking the cafe for their donation. On the same wall, nearer the door there is a large grey notice board covered in pieces of paper, and posters of all colours advertising local information, services, or events. Other places on the left-hand and right-hand walls are taken up by colourful posters displaying clever religious slogans or bible verses. I do not remember off the top of my head what is on the far wall, as it is a good few weeks since I was inside the cafe. On the wall nearest the entrance to cafe, a solitary blue door, much like the front door of a house, is a large window made up of several pains of glass, each one held in place by a wooden frame painted white. In front of this is the unofficial “trolley park” sometimes occupied by buggies or prams. The rest of the space in the cafe is taken up by several wooden tables, which I imagine not to be solid wood, but the type that has a wood-effect covering on the outside, with a circular metal base, and one wide leg in the middle. The vast majority of the chairs are also wooden, although there are two small brown-leather (faux-leather??) sofas with a small coffee table in the middle, next to the music speakers, and the specials board, contradiction in terms because extra dishes are written plainly, in white chalk on regular blackboard slate and are generally nothing fancy, though the regulars seem to like them. Near this is the counter, with a glass shelve unit which displays the cakes and tray bakes and keeps cans and bottles of pop cool. At the other end of the counter is a standard regulation automated till. Behind this end of the counter is a back wall covered in shelves and a unit which contain cups, saucers, mugs, plates, There is also a big dispenser which contains a large jug of filter coffee. Very good it is too! The above is as detailed a description of the place as I can summon from the brain, but the thing which really captures my imagination is the glass-fronted cake-counter. As I can see it now in my mind, there are three categories of cake — old fashioned favourite, the simple classics, and new fangled favourites, so they might have butterfly cakes, which remind me of bake-sales at school, classic carrot cake with slices cut out, and American style chocolate brownies. I seem to remember other things such scones, flapjacks and mars-bar crispy cake, all of which remind me of being at my Grandparents house for tea on a Friday night while I was growing up. A treat then as now, and all home-made, familiar and comforting. Apparently the lady who makes the cakes for the cafe is a lady who makes cakes for a living anyway. Nothing in the cabinet stikes me as being overly fancy; however if you are looking for good quality cheap coffee and tea and an afternoon treat, or a morning bacon roll and pot of tea with a friendly atmosphere and a warm welcome, look no further than ABC!! I couldn’t just write about one local cafe. I love coffee, and cake, and my friends. So, coffee and cake with a friend or a group of friends is my favourite way to spend an hour, a couple of hours, even a whole morning or afternoon. My first recommendation is the “ABC” just round the back of the nearest Asda and staffed, voluntarily, by a local church. Good strong coffee, homemade cake, and a warm relaxed welcome. On a budget. I recently bought two coffees and a butterfly cake, I think it was under three pounds, or thereabouts. My second recommendation is Hazel’s slightly further away and more upmarket. Fabulous coffee, and amazing cake. I can never choose which cake to have. The place is always packed. I can recommend the sandwiches, and the beefburgers too. The warmth of the welcome matches the quality of the food. The only downside is, because the place is compact, I could potentially drive my Electric Wheelchair there, but there wouldn’t be space to sit in side without blocking at least two other tables. Of course, the natural solution would be to sit outside. Given the weather though, I won’t be volunteering! My next recommendation is just as local, in the other direction. The Granary is always packed, even though there are now many more tables than in the previous ‘Little Granary’, and there are queues out the door again even though the larger building has only been open a few months. I can recommend quite a few dishes on the menu because I’ve probably eaten it before. There is local produce on the menu… so local that it’s travelled from one part of the farm to the other, so there are no ‘food miles’.The farm’s eggs are a best-seller. I’m told people go there just for those! There is also a shop attached to the cafe where you can buy meat from the farm, and local cheese, and lovely gifts. The best part is, after costs, the money goes to support the social enterprise based on the farm. The final cafe I recommend is ‘Perk cup’ further afield in the centre of Leeds. I only discovered it a week or two ago. Is near Waterstones bookshop, I think. 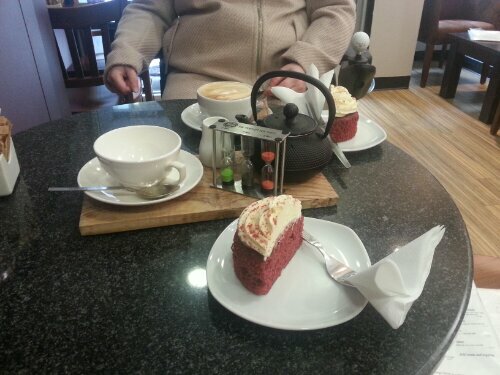 Fabulous cake, tea and coffee, great customer service, a warm welcome, and great value for money. Even my wheelchair didn’t bother them either, and there was plenty space for me. Here they think about all the little touches as you see from the pictures. Even on the way to the loo (bathroom, restroom!!) there are little blackboards on the wall for people to add their names, so the cafe can keep in touch on Facebook, and other so people can write comments about the cafe. I don’t think the carer with me took a photo of the blackboards. but they’re really cool. I can’t wait to visit again soon. ‘Perk cup’ is my new favourite! Go and check it out for yourself, you won’t be disappointed! The image shows a black teapot, a tea-timer with three egg-timers, one green, one black, and one orange, and a white cup and saucer on a plain wooden tray/board. In front of the wooden try sits a white plate and napkin with half a massive ‘red velvet’ cupcake with white icing/frosting.